August 24th, 2015. Today Digimon Adventure V-Tamer 01 writer Izawa Hiroshi uploaded an early draft from V-Tamer to Twipple, in commemoration of the manga's recent electronic reprint. 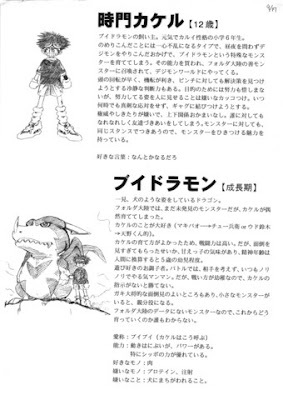 Izawa attributes the prototype character designs to September 17th, 1998, three months prior to the manga's first serialization in V-Jump magazine. In this early version of the story, eleven-year-old Yagami Taichi was instead twelve-year-old Jimon Kakeru, and Zeromaru was nameless but nicknamed V. V. by his owner. According to a 2001 statement by Digimon Adventure director Kakudou Hiroyuki, prior to the manga's serialization executives at Toei chose the name Yagami Taichi to be used for the concurrent main character across all continuities. This, along with the Adventure title shared across V-Tamer, the 1999 film, and the anime series, helped improve brand awareness among audiences of the multimedia franchise. Jimon Kakeru is described in the draft as an energetic and simplistic sixth-grade boy, who raises a special monster. V-Dramon is stated to be a Child-level Digimon in the draft rather than Adult as in the final manga, and is said to have some emotional dependence on Kakeru, with his mental age being around that of a five-year-old human child. 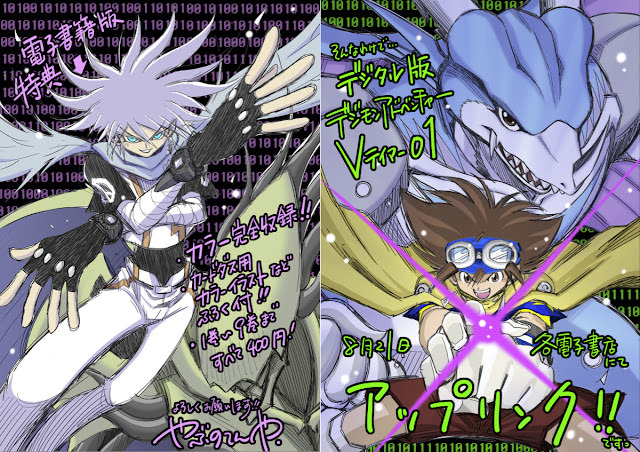 The draft is otherwise close to the final version of V-Tamer; Kakeru is summoned to "Digimon World" by the residents of Folder continent, seeking his abilities. Previously Izawa met up with V-Tamer illustrator Yabuno Tenya on the day of V-Tamer's closing anniversary, on August 21st. Both Yabuno and Izawa have been celebrating the anniversary, with Yabuno posting several of his latest illustrations of the characters to Twitter. As the day of the reprint announcement approached, Yabuno jokingly encouraged fans to send their reactions to V-Jump magazine. "Depending on the reaction, a paper version could be approved...probably? Go ahead, send V-Jump's editorial department a hot message! (Laughs)" Yabuno later commented that he had forgotten about the early draft details, and explained that it was Izawa who came up with the 01 title from his "calculations." (This is in reference to the origins of several characters' names; Rei was named for the Japanese reading of the number 0, and Neo from an anagram of One. Taichi and Zeromaru are counterparts to these characters, as Ichi is the Japanese reading of the number 1 and Zero the English reading of 0. Maru is also the reading for a circle, hence ichi-zero-maru is a play on 100%.) Izawa responded to Yabuno over Twitter that he chose 01 for its digital significance and because of how the addition of ichi turns zero-maru from 00 to 100, creating the series' titular "100% combination."